We offer two varieties of tile line maps. First, we can use our GPS mapping field units to map new tile lines as they are being installed. This information can be exported to many popular mapping programs. We can also create custom paper maps that could also include base information such as field boundaries, background aerial photographs, digital elevation maps, roads, streams, or any of a number of other layers. Our other tile line services is the location of pre-existing tile lines. 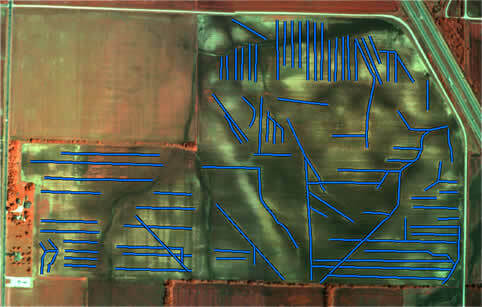 To do this, we use aerial photographs such as the one below to locate the tile lines that are already in your fields. 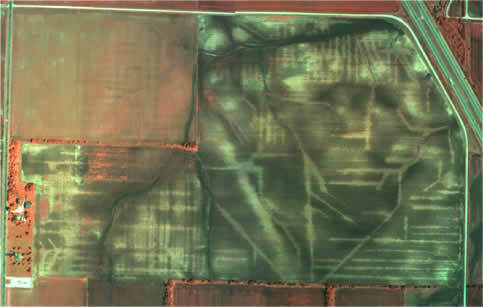 We already have a number of aerial photographs in our archives and are adding more every day, call us to find out whether we already know where YOUR tile lines are! If we do not already have good photographs for your area, we can get them. Locating pre-existing tile lines can be a big bonus for both the farmer and the tile installer. Farmers can benefit from knowing where tiles already are. Using these maps, existing tile lines can be located and evaluated for use in a new tile system, improving overall performance of a new system, and possibly saving money. Tile installers using these maps no longer have to spend a significant amount of time guessing where tile lines are before beginning evaluation and installation. Armed with a GPS unit and these maps, tile installers can quickly locate and evaluate existing tiles, making the tile installer more efficient. The time saved can be used to install additional tile, meaning more acres can be tiled in a single season.